I’ve been expanding my horizons lately and trying different types of workouts in the past few weeks other than running. For example, last Thursday, I went to a Hip-Hop dance class with my sister for the first time. As much as I love running, I also love other variations of exercise that challenge me to utilize different muscles in my body. Earlier this morning, I participated in an Iron Strength Workout that was held in Central Park at 6AM by the well-known Sports Medicine Physician, Dr. Jordan Metzl. This event was held in conjunction with my team at Runner’s World due to the high demand of participation for this type of workout. I have never done a workout like this before, so I was curious as to what was in store for me. A colleague of mine had warned us, prior, that it was not to be taken lightly, and for him to say that definitely rattled my bones a bit. I woke up this morning at 5AM on the dot. My first thoughts were, “I can’t believe I’m waking up this early for a workout” (I’m more of night owl when it comes to exercising) I got ready in only a few short minutes and headed over to Central Park. When I got there, the sky was still dark and my eyes were still heavy. As the sun began to rise, more people started coming in waves and I was finally waking up. 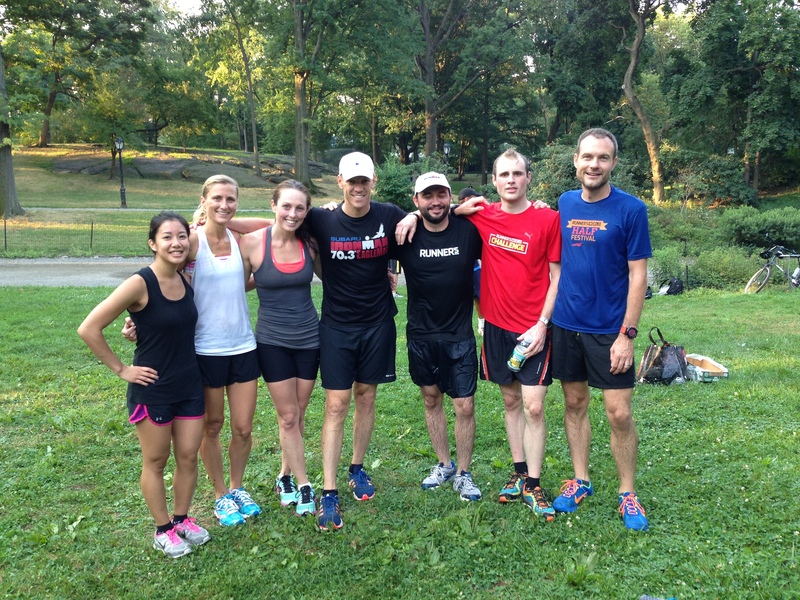 Once it turned 6:15AM, Dr. Metzl made an announcement, introducing my colleagues from Runner’s World and myself. Shortly after, we dove right into running. I had no time to loosen up, so I just had to shake it out during the run. I’d say that I was feeling the burn right after the 3rd set of jumping squats. My overall assessment of the workout is an A+ rating. This workout incorporated all parts of the body with enough rest in between for recovery. It included cardio as well weight training, balance, and flexibility. I was extremely satisfied with how I felt afterwards because my muscles were in pain (which is a good thing) I always love testing my limits and breaking new barriers. I was able to evaluate my current fitness level through this workout and I know now what I need to work on to become a better runner and overall athlete. Never be afraid to try new things. You never know if it might be something you fall in love with. And if it’s not, at least you learned something new. Knowledge is power. Expanding our horizons helps us grow. This past Friday night, my friend and I traveled from New York City to West Virginia to compete in a sprint triathlon as a co-ed relay team. We arrived in West Virginia around 1AM on Friday night after a painfully, long 8-hour drive out of the city. The next day, we had little room to spare/sight-see. Aside from the race, we also happened to be attending a wedding on Saturday evening which made this a dual-purpose trip. The wedding began at 5:30PM on Saturday night. When we arrived, we made our rounds to greet everyone and left around 9PM to drive an additional 2 hours to the location where the triathlon was taking place. The next morning (Sunday), we woke up at 6AM in order to make it in time for packet pick-up at 7AM. The race took place at 8AM. During the awards ceremony, we were anxiously waiting to hear our team name to be called. We were hoping to make it in the top 3 out of the relay teams, but unfortunately came in 4th place, only a minute after the 3rd place relay team. Overall, I wasn’t disappointed with our performance. The weather conditions were fair, but the competition was stiff. I enjoyed competing in a new location and an event that didn’t involve simply running (even though that’s all that I did) The pitfalls that came with this race centered more around the mis-communication with the people that were involved in the execution of the race. A lot of participants, including myself, had questions that the volunteers were having trouble answering. It was, however, a smaller race with less than 200 finishers. 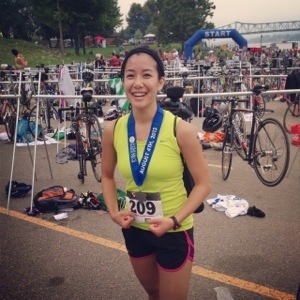 After this experience, I’m more than convinced to compete in a triathlon on my own. It’s much harder to train for a triathlon in the city, as opposed to a running race, but I know that hundreds/thousands of people do it, therefore it will be my next short term goal. Finding a decent pool and buying a bike will be a challenge, so hopefully those things will come in time. I want to constantly push myself to the next level and become more well-rounded in various types of races. Coming up next is a race that I’ve been wanting to participate in for quite some time: a fun run. I’ll be running the Electric Run in Brooklyn this September with a group of people from Nike Run Club. It will definitely be a change of speed for me (literally), but I look forward to it. It will also be nice to remove my competitive nature, but I can’t guarantee that will happen. Last night, I went to Nike Run Club at the NikeTown Store (on E. 57th Street in Midtown) for the first time in a few months. Judging from my last entry, I seem to be getting back in touch with things I haven’t done in a while. I’ve only gone to Nike Run Club 2 or 3 times before. A co-worker convinced me to try it out a few months back and I really enjoyed it the first time, but it just never stuck. Last night happened to be the first time I ran outside in over 2 weeks. After my 39-day running streak, I took a break for 6 days, then started running again, but only used the treadmill due to the overwhelming heat wave that hit New York City. I was nervous about how I’d perform running with other people. I’m typically a lone runner, but it’s nice to run with people so that they can push you. I dove right into the 5-mile distance and was worried that I wouldn’t be able to last- After all, I had taken a short break and have recently only been logging 2-3 mile runs on a machine. However, I ended up feeling great afterwards and was happy to connect with other runners from around the city. This, along with my singing, I hope to keep myself busy for the rest of the Summer. 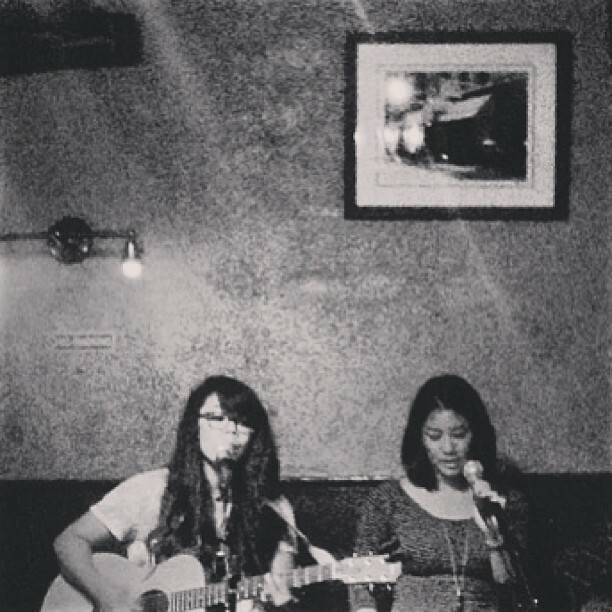 Last night, my sister and I performed at an open mic at Caffe Vivaldi in the West Village. This was the first time we sang in public together since around February. After months of sporadic rehearsals, we finally chose a time and place. At first, I was pretty confident since we had just practiced the night before and sounded on point. Of course, it’s always the last few minutes prior to the actual performance that really shakes my nerves. 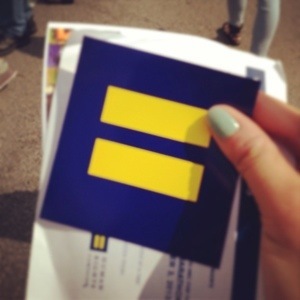 Once we got on stage, I could feel my voice starting to tremble. We made it through the first song with hardly any flaws, but I became gradually more nervous as I looked around at the audience. After our set was done, I kept re-playing the second song in my head, nit-picking every mistake that I knew I had made. At that point, there was nothing I could really do except tell myself that it was already over and we just have to practice more for next time. Singing isn’t a priority for me. If anything, it’s basically at the bottom of my to-do list. It’s just something I do for fun to take my mind off of the more important things in my life. Then I realized, it’s really just a matter of making time for it. I know that if I spent half as much time practicing making music as I do running and exercising, then I could be as good as the other performers who played at the open mic last night. I’m currently not training for a specific race at the moment, so I decided that I’m going to try distributing my time into other areas of my life (singing and writing) and see just how far I can go with it. I’ll continue to run and go to the gym of course, but I want to become better at other things as well. After all, that’s how you grow. After a mini-hiatus from blogging and running, I’m now refreshed and ready to get back into a routine again. I recently ended a 39-day running streak, courtesy of the Runner’s World Run Streak, that I participated in. For the past few weeks, I was counting down the days until I could stop my legs from moving that fast. Once July 4th hit, I wrapped up my last day of the running streak with an easy 4-miles in Central Park. The next day, I relaxed more than I have in the past few months. This continued until the following Wednesday. Taking a step away from running and writing gave me the time I needed to break out of my routine, kick up my feet , and not worry about logging any runs, re-arranging my schedule, or missing out on events due to my running streak. It was nice to take a breather. Alas, I’m back and in the right mindset again. I’d say that the longer I stay away from running, the more chaotic my life seems to get. It’s definitely the glue that holds everything together for me. This is a tad bit overdue, but not so much to the point where I have completely lost the impact that this race had on me. This past Saturday, June 29th, I ran my first race since the Big Sur Marathon back in April. 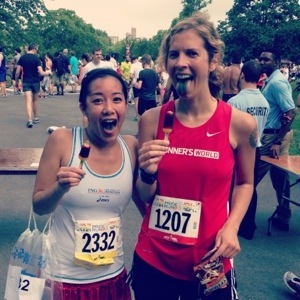 I ran the 5-mile Front Runner’s New York Pride Run in Central Park. I signed up with my sister, which is automatically sentimental to me because anything I do with my sister has a great deal of significance. This was the longest distance race that she has ever entered and I couldn’t be more proud of her for completing it. This race also greatly affected me in terms of realizing how far I have come with the hard work that I have put in throughout this past month. I am still in the midst of the Runner’s World Run Streak from Memorial Day, May 27th, up until this very day. On Saturday, it was brutally humid and I just wasn’t in race mentality. Once the clock started, my legs felt like lead weights. In all seriousness, I had even considered walking at mile 3. I was tired, hot, and frustrated. I convinced myself that I wasn’t going to run a decent time. Miraculously, approaching mile 4, I began picking up my pace because I just wanted the race to be over already. In my head, I just kept repeating to myself, “I’ll take it. It’s not the best time, but it’s not the worst” and considering how I felt, I was amazed to even run anywhere near that time. Upon finishing, I looked around in a complete daze and saw so many smiling faces. This race meant a lot more than what I perceived it for myself. It was a celebration for others. Then, I saw my sister running through the chute and I didn’t care an ounce about my performance. I ran alongside her to the finish line and was just happy. Later that day, I searched in Google for results from the race. When I checked my chip time, I saw that I had actually PR-ed. I felt instant gratification and couldn’t believe that I had PR-ed after feeling like I had just ran the worst race of my life. I looked back and thought about how much training I had invested for this race, without even realizing it. I have been running for 36 consecutive days now. To be able to run a race and PR after never getting one day of rest truly amazes me. Every day, I surprise myself with the infinite possibilities that can be created from hard work, dedication, and perseverance; not only in myself, but everyone. We all have a capabilities beyond our wildest dreams. From what I have learned after all of this run-streaking is that we can create our own miracles. All you have to do is set a goal and make it happen, and it surely will. I have officially been running for 31 consecutive days. Now that I think about, I’m not even quite sure why I decided to do this in the first place. Over time, it seems that our reasons for doing things change over the course of the journey. Or maybe we just lose sight of the reasons. For me, after a while, running every day just became second nature. Another daily routine, like brushing my teeth or eating a meal. It’s always good to re-discover our reasons for the things we love to do. Without recognizing our reasons and motives for these things, everything just seems sort of meaningless. We need to feel that what we do has purpose. We need to feel that to attain happiness. I never want to lose sight of the reasons I run. Knowing why I love running gives me hope that a feeling like this can last. A feeling of passion. In life, we stray from many things. The love we feel in a relationship. The love for our job. Sometimes even the love of life. It’s necessary to be in touch with our reasons for the things we love to do. It’s necessary to survive. However, knowing as much as I could possibly know about myself up until this point, I’ve realized that trying to be too in control of a situation never works out in the end. It often just leaves me with high hopes that are eventually shattered into a heaping pile of disappointment. That, or, I mess things up before they even begin. Or get sick. Yesterday marked my 24th consecutive day of running, (due to the Runner’s World Run Streak) but more importantly, it was also a 5K PR day for me. 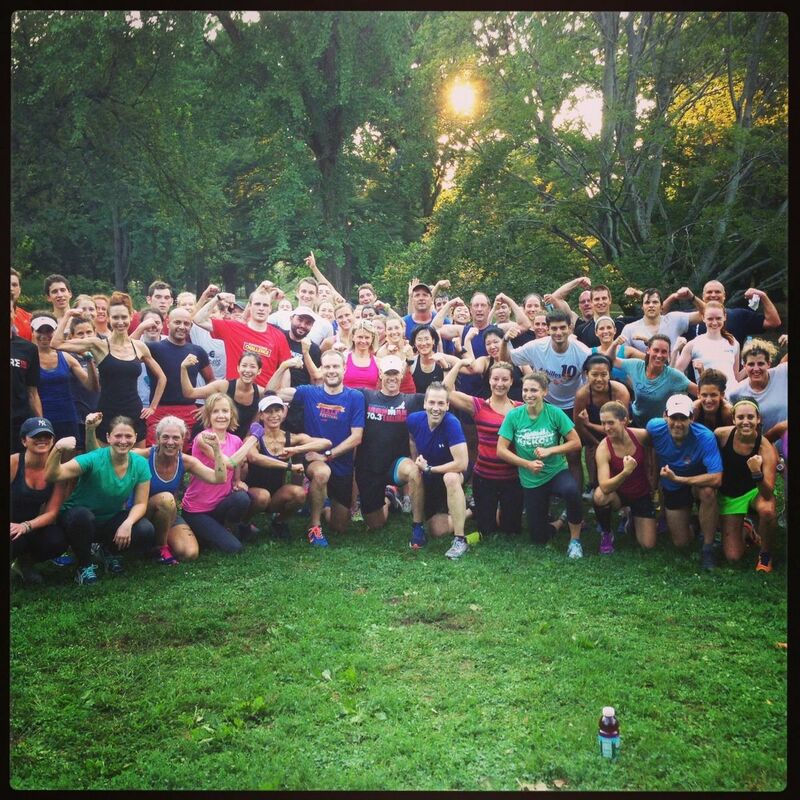 My co-workers and I spontaneously decided to do a 5K race in Prospect Park in Brooklyn. Originally, I had plans to attend a “Runner’s Happy Hour” event that I was invited to by another co-worker. Instead, I decided to change up my plans and run the 5K because honestly, I’d rather spend $5 on running than $5 on drinking. I found that it ended up being the best decision I made all day. I had no expectations for this race at all and I learned that when you make a spontaneous decision that fast, there’s really no time to over-think the situation or stress out about the outcome. I’ve always envied people who would just “go with the flow” or “let things happen” I never understood how someone could live like that. I was always a believer in “If you want something, go get it”, and that’s how I’ve always done things. That’s how things have always worked out for me in terms of success. Yet, I now know that this mindset doesn’t apply to every situation, especially when it comes to having fun. Yesterday, I went with the flow and let nature take its course. I didn’t stress or worry, and I ended up placing 1st in my age group and running a 5K time of 21:30 that I never imagined I could get back to after high school. It was a small restoration in my confidence and my overall quality of life. A re-occurring theme that I am now settling on for this blog is balance. It’s a skill that I’ve been trying to grab a hold of and will continue to grab a hold of for the rest of my life. It’s necessary. Sometimes you need to be serious, and sometimes you need to be fun. Not too much of one or the other. Earlier on, I blogged about stagnancy (Refer to: On Setting New Goals) After I ran the Big Sur Marathon and the dust had settled, my excitement finally wore off. I began feeling the itch to create a new goal for myself. Luckily, an opportunity presented itself in the form of the Runner’s World Summer Run Streak 2013. 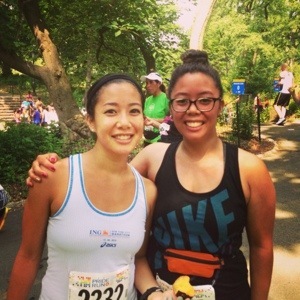 The first time that I tried the Runner’s World Run Streak, it was around Thanksgiving/My birthday, and I basically chickened out within the first few days of starting. This time around, I have no excuse. It’s a perfect way to stay in shape for the Summer as well as train for upcoming Summer/Fall races. I couldn’t ask for a better deal. I’m currently on Day 15 of consecutively running and I feel pretty amazing. I’ve been cutting back on the mileage when my legs need the rest, but for the most part, my runs have been very strong and consistent. The next race on my calendar is on June 29th, where I’ll be participating in the Front Runners 5-Mile Pride Run in Central Park. And transitioning from this, I can also say that I’ve been feeling very optimistic about other areas of my life again. Looking back on past posts, it’s interesting to see the drastic change in my attitude from one day to the next. Sometimes, all you really need is a little spark to get you started. From there, it’s up to you to keep the fire going.